These earrings were so easy to make, and I really love them! 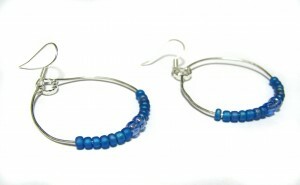 I called them “Simply blue” because they are simple, yet don’t be fooled – they look really elegant when worn! These beauties can be bought on my Etsy store and my DaWanda store. These cute hoop earrings are so light yet elegant, and made from a silver toned copper wire manipulated by hand hanging from silver plated earwires. 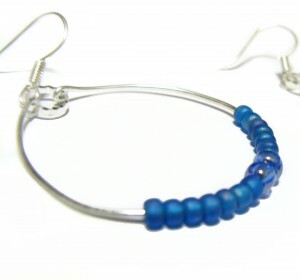 The beads are glass beads in two shades of blue and two sizes. Te diameter of circle is 3 cm (1.2 inch).